Searsport captains were sought after for their experience and good reputation. They frequently commanded ships built and at least partially owned in Searsport, but they were also hired to sail vessels built and/or owned in Bath and other parts of Maine, Boston, New York, and other port cities. Many of their vessels were named for prominent individual captains or owners, among them B. F. Carver, Benjamin Colcord, David Nickels, James G. Pendleton, Jeremiah Merithew, Phineas Pendleton, and William McGilvery. Even more numerous were vessels bearing the names of wives, daughters, and mothers, including Sarah A. Nickels, Wealthy Pendleton, Nancy Pendleton, Lucy A. Nickels, Georgia Gilkey, Eliza Merithew, Harriet H. McGilvery, Clara E. McGilvery, and Clarissa B. Carver. 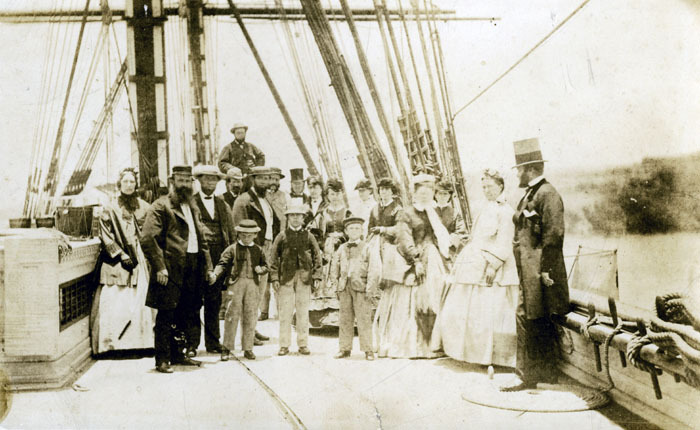 Searsport captains, like others in Maine, often took their wives and families with them on trading voyages around the world. Approximately sixty children from Searsport were born at sea, and over seventy women accompanied their husbands. For their stories, see Stories of the Sea: Women’s Roles. In our chapter on Life at Sea we described the various members of the crew, their duties, and how the families of the captain lived while aboard. In this chapter we present some personal stories about captains from Searsport. Commanding a large wooden merchant vessel with a crew of 20 – 30 men was a difficult and sometimes dangerous task. Captains experienced storms, collisions, and wars; and had to be skilled in business and economics as well as seamanship. Their stories illustrate their lives.